Three-year-old Mason showed pretend snow to Stephanie Carlson, a professor in the Institute of Child Development. Carlson is also CEO of Reflection Sciences, one of three start-ups to emerge from CEHD in fiscal year 2015. It’s no coincidence that the birthplace of the University of Minnesota is just downriver from St. Anthony Falls on the Mississippi. As a land-grant research university, it has served the state’s needs from the beginning. Public art outside the Education Sciences Building on East River Road commemorates the red-brick giant’s former life as the Mines Experiment Station, where the taconite production process was invented. Today the renovated building is the home of the Department of Educational Psychology, part of the College of Education and Human Development (CEHD). The focus within its walls is now on learning itself. And the inventing continues. 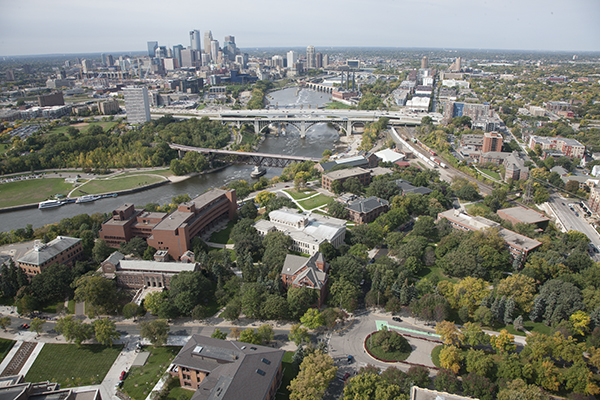 Historic knoll of the University on Mississippi River’s east bank, home of CEHD, looking northwest to St. Anthony Falls and downtown Minneapolis. Photo by Steve Bergerson. The Bayh–Dole Act of 1980 for the first time allowed universities to commercialize findings from research conducted with public funds. As cuts to universities’ budgets accelerated in the early 2000s, the incentive to commercialize rose at the same time as technology was revolutionizing the possibilities for educational products and services. In the past decade, the University’s Office of Technology Commercialization has launched 84 start-up companies. The first to emerge from CEHD was based on the research and development of faculty in the Department of Educational Psychology a few years ago (see sidebar box, below). That proved not to be just a flash in the pan. In the fiscal year that ended June 30, 2015, the U launched a record 16 start-ups, and three of them came out of CEHD. Reflection Sciences, FastBridge Learning, and Vidku each has a distinct vision and path to success. “Not just the funding but the values of our college need to be front and center in our land-grant mission,” says CEHD chief of operations Ryan Warren. These are the stories of the faculty and research behind three CEHD start-up ventures. The first start-up for CEHD to be developed through the University’s Office of Technology Commercialization was built on 15 years of research in the Department of Educational Psychology. Established in 2012, Early Learning Labs (ELL) is the home of a suite of assessments called Individual Growth and Development Indicators, “myIGDIs” for short. The tools are a combination of test kit and assessment system plus a web-based management and reporting framework designed for schools, teachers, and early-childhood specialists. They help identify children at risk for developmental delays early and monitor development gains to help them become ready for school. The research behind myIGDIs was funded by the U.S. Department of Education. The assessment was invented by faculty members Scott McConnell, Michael Rodriguez, and the late Mary McEvoy with research associates from the Center for Early Education and Development (CEED), Tracy Bradfield and Alisha Wackerle-Hollman. Early Learning Labs’ newest tool is an iPad app licensed with Wackerle-Hollman. IGDI assessments have now been used in more than 12,500 school settings, measuring more than 300,000 preschool children. In December, IGDIs and FAST were among online assessment systems to win the Minnesota Department of Education’s highest rating. Learn more about Early Learning Labs at www.myigdis.com.